PermaSEAL 8 Mesh is a high quality cavity drain waterproofing membrane suitable for use internally above and below ground to isolate damp or wet walls from integral finishes. 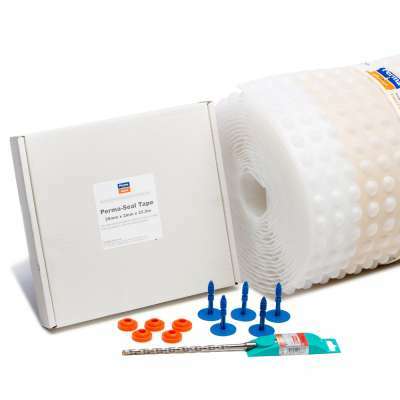 Can be used in damp proofing and waterproofing situations. PermaSEAL 8 Mesh is a high quality high density polyethylene (HDPE) membrane suitable for use in waterproofing structures below ground level (basements) and isolating damp walls above ground level. The stud depth of 8mm provides a suitable air gap for use as a wall applied membrane. Note: Due to stock levels we will send 2 x (2m x 10m) rolls for this kit not the original 2m x 20m roll. We appologise if this causes any inconvenience. PermaSEAL 8 Mesh is suitable for use in accordance with BS8102:2009 to provide Type 'C' drained protection to structures below ground providing a Grade 3 dry environment suitable for domestic or commercial use. PermaSEAL 8 Mesh is guaranteed for 30 years and has a life expectancy of at least 50 years (DIN 9001:2000). P-Seal 8 Mesh is an inert product with high compressive loading stability. It is highly resistant to water, alkalis, saline solutions and organic acids, and is not affected by minerals. It is also resistant to bacteria, fungi, and other small organisms. This mesh waterproofing membrane can accept a range of wall finishes. The mesh fabric welded to the face of the membrane is the ideal key for direct render finishes or for dot and dab plasterboard. PermaSEAL Mesh membranes are ideal for use where space is at a premium for example staircases small rooms etc as when finished with a render the total surface thickness can be as slim as 20mm including the membrane. Read our for more on how to complete basement waterproofing and converting basements. The mesh fabric welded to the face of the membrane is the ideal key for direct render finishes or for dot and dab plaster board. Permagard are the third company i have tried for this type of kit and the only company to supply enough pins to fix the membrane flat to the wall. Good price too.